We have no puppies at this time.� Please check back soon for Fall 2008 breeding plans. 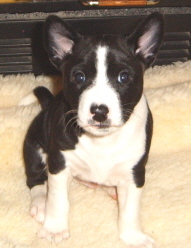 While we are not breeding this year, we are happy to refer you to a responsible breeder that does have a litter this year,email us for information.� You can also visit the South Coast Basenji Fanciers, the Basenji Club of Northern California, or the Basenji Club of America for breeder directories. Please check OFA to make sure at least one parent in any breeding you consider has tested Probably Clear/Normal for Fanconi Syndrome.